That pig of a man didn’t fool everyone! Riots in Egypt were a feature of 1921. So was Greece’s disregard of the League of Nations when it waged war on Turkey on 14 October. By Christmas of the same year the Irish Free State was set up by Peace Treaty with Britain. Amid such history-making world events of 1921, over in Snake Creek quarry in western Nebraska, USA, geologist Harold J. Cook was quietly studying the Pliocene rock beds in Sioux County. Nothing very newsworthy here. But the next day there was no cooling down. A leading tooth authority, Dr W.K. Gregory, declared that Osborn was right. He agreed that the Nebraskan tooth was an upper molar from an anthropoid. They believed this indicated the first find of man’s ancestors in America. 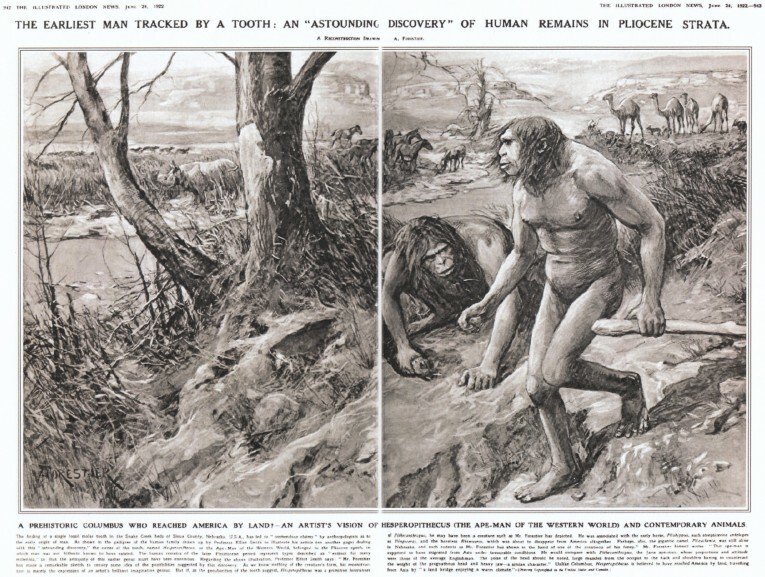 The Illustrated London News in 1922 featured an artists’ impression of the newly discovered ‘ape-man’ Hesperopithecus (‘Nebraska man’). The whole scene was imaginary—all that had been found was what turned out to be nothing more than a pig’s tooth. Despite this substantial doubt and conflict of opinion among the experts of the day, the public clearly had been led to think that Hesperopithecus, ‘Nebraska man’, was a major evolutionary discovery. Here indeed seemed proof that a creature on the evolutionary path to humanity once lived in ancient America. After looking at the family scene created by The Illustrated London News artist, could any average reader doubt the testimony of this tooth? By 1925, Osborn said that ‘every suggestion made by scientific sceptics was weighed and found wanting.’8 Was Osborn right? To shine more light on the controversy, a fossil-hunter named Thompson headed off to the Snake Creek quarry where Harold Cook had found the original tooth. He was on the trail of more specimens of ‘Nebraska man’. ‘Nebraska man’ was not accepted by many of the leading experts who studied it, or its cast, at the time. Yet the public was given the impression that this tooth was a major piece of evidence for evolution. It hardly needs to be pointed out that this pig’s tooth incident could not fool anyone who does not believe in evolution—either then or now. A burning desire to prove evolution or disprove God’s creation is what leads otherwise intelligent scientists and skeptics to fail to question evolutionary assumptions adequately. 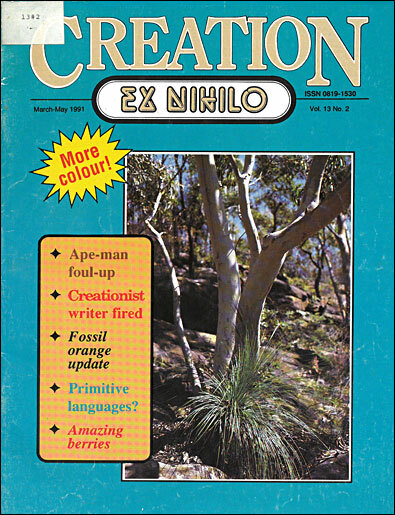 But faith in the Creator-God of the Bible and His Word, which tells us that man and all other major kinds of creatures were created—they did not evolve—is the Creation 13(2) antidote to being taken in by such astounding evolutionary claims. There is no indisputable evidence that man has ever evolved from apelike creatures. ‘Nebraska man’ is merely one warning to all not to accept evolutionary interpretations as evolutionary facts. Sir Arthur Keith, The Antiquity of Man, Vol. II, Williams and Norgate, London, p. 475, 1925. The Illustrated London News, 24 June 1922, pp. 942–3. Sir Arthur Smith Woodward, Nature, Vol. cix, p. 750, 1922. Professor Schlosser, in Zittel’s Grundzuge der Palaeontologie, 1923 (cited in Keith’s Antiquity of Man, p. 476). John Reader, Missing Links, Book Club Associates/William Collins Sons & Co. Ltd, London, p. 110, 1981.